Happy Labor Day! I hope you had a relaxing long weekend! Unfortunately, not everyone gets Labor Day off to rest. My poor Dad had to work today. Even if it wasn't a long weekend, I hope you were able to do something fun! Like many Americans, we headed to the beach! I love when we go out to New Smyrna. It's like all responsibilities melt away. We get to relax without the guilt of my daily To Do list. We bought our beach condo at the beginning of the year and have been working to make it great on a budget ever since. 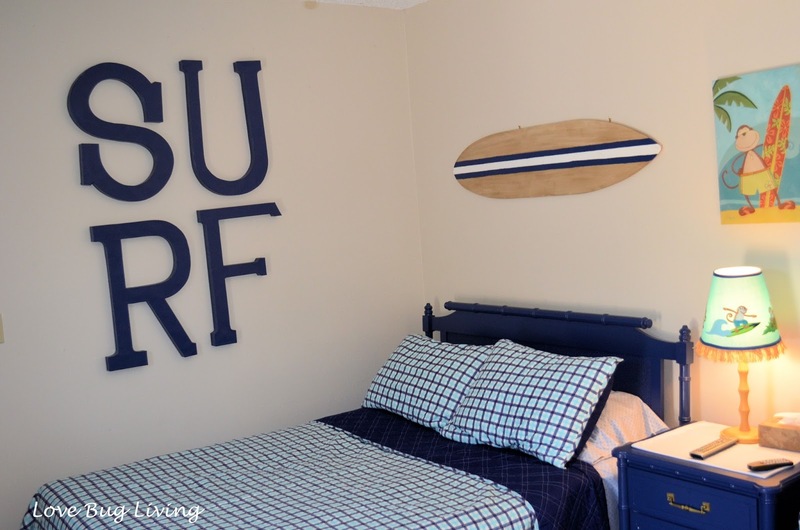 I shared my SURF Giant Letters that we made for the girls room. We've since added a few more things to complete their room, including this fun Surfboard Wall Art. 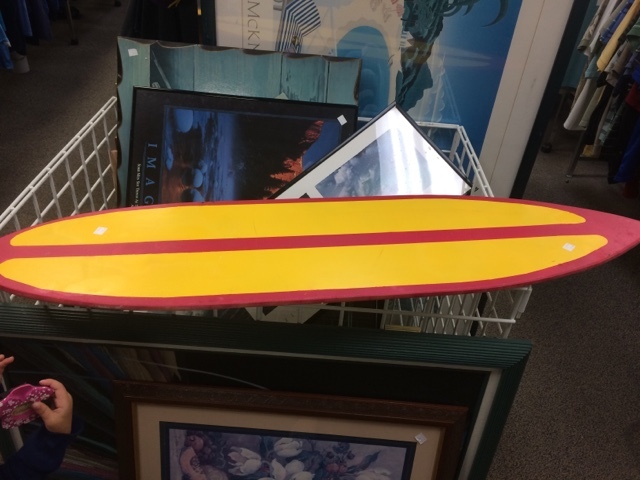 I found this surfboard art at Goodwill for $5.99. I wasn't too big on the colors. Ick! Ketchup and mustard colors. But I also knew it had potential. It was the right price to make something great. I started by painting the whole thing with a thin coat of primer. The colors were so bright that I didn't want them to bleed through at all. 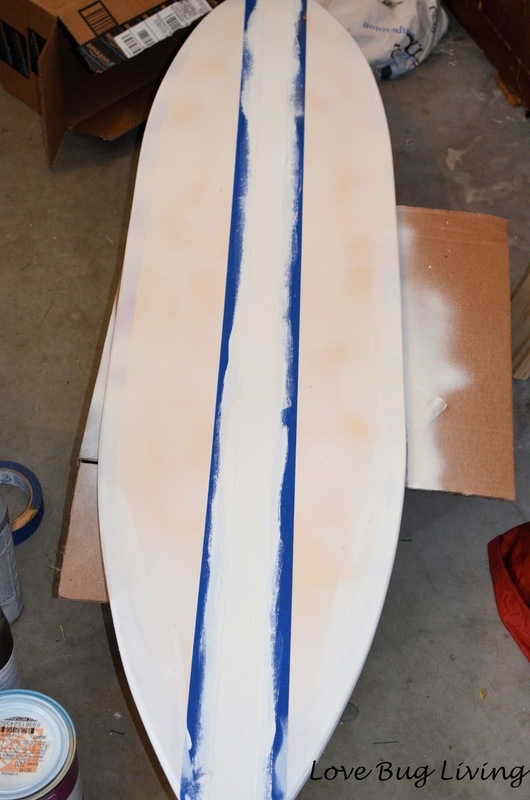 After the primer dried, I taped off the red stripes down the middle of the surfboard. 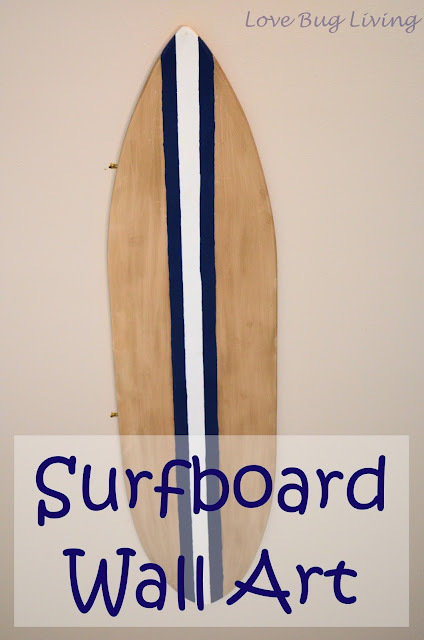 I decided not to paint the contrasting stripes down the edges of the board, but just make them the same color as the rest of it. I did paint the middle stripe a bright white. I painted a couple of coats to make it fully covered. My next step was to paint the outsides of the board a beige color. I gave it a second coat as well. After it dried, I rubbed on a darker stain with a rag in order to give my surfboard a more real wood look. Wipe it in the same direction you want your wood grain to go. Give it a good even coat. You can add more or even wipe the excess off if it is too dark. Allow to dry completely. After it dried, I peeled off my blue painter's tape. I can see the stripes underneath between my wood grain and the white middle stripe. 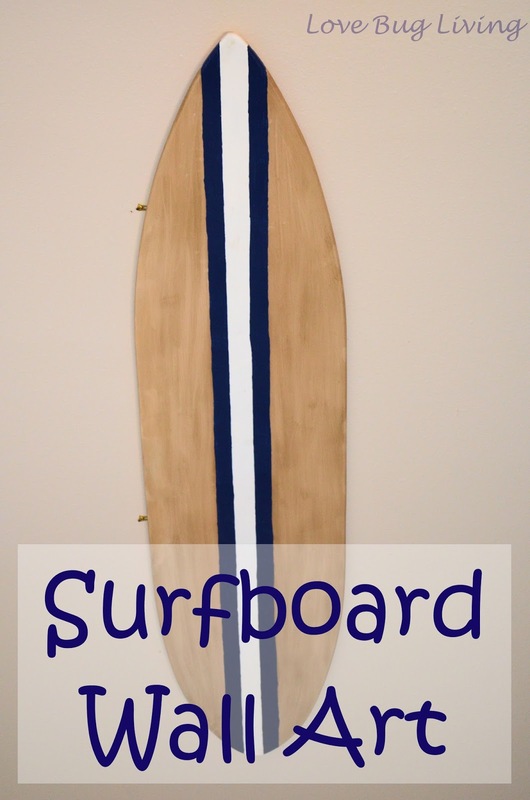 I used a dark blue paint that matches my SURF letters and a steady hand to paint my blue stripes on either side of the white stripe. You could also tape it off to make sure you paint a straight line, but I just went for it and it turned out. 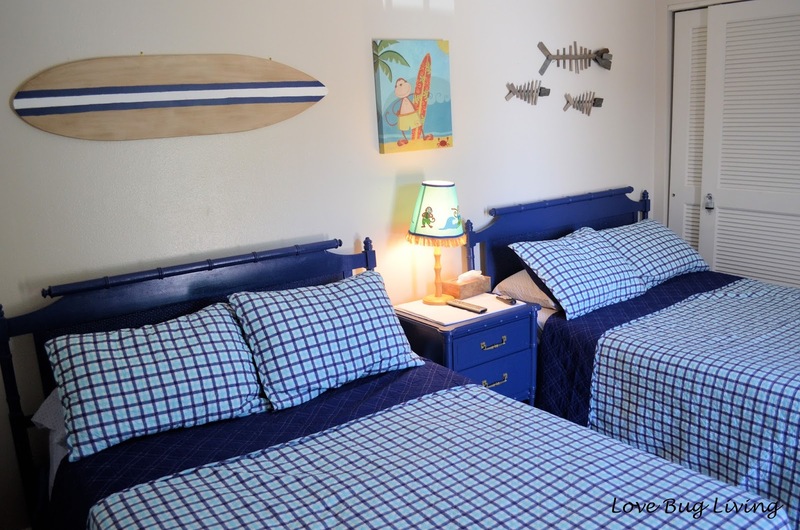 The surfboard came out great and was perfect to hang on the girls wall at the beach. I love how the stain gave the board a wood look. So much better than the red and yellow. Not lucky enough to find an ugly surfboard to update? 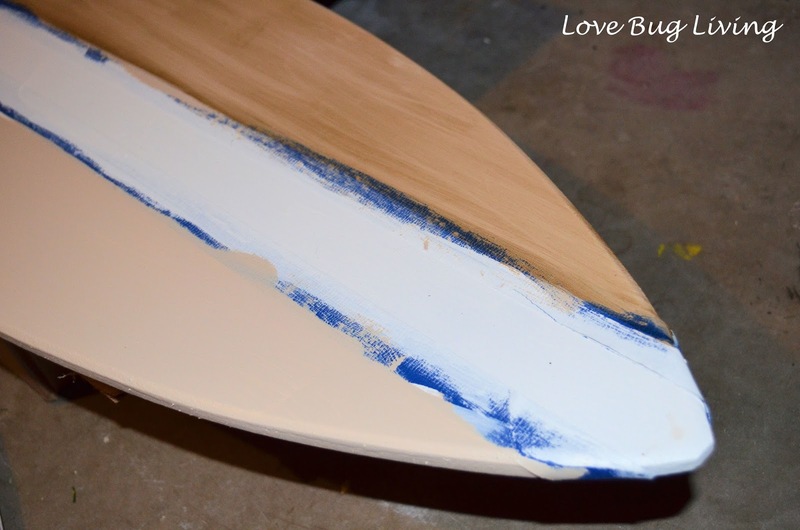 Just cut your own surfboard out of a piece of plywood! That just meant we had to find something for over the other bed. 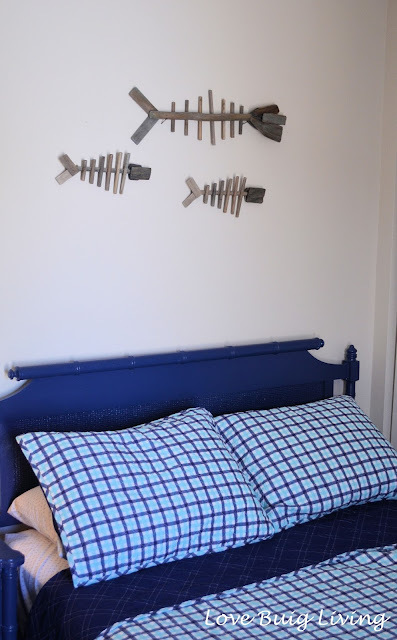 Luckily, I came upon these awesome wood fish bones on sale at Marshall's for only $7 for the three of them. A cute addition to the girls room. I also found these two matching Tommy Hilfiger quilts for only $35 each on sale at Homegoods. I had already found this cute monkey surf lamp at Goodwill and later found this cute surf monkey canvas print at Ross for $7. Love when a room can come together and stay on budget as well.